UPDATE: See the launch action on my post here. The advertising billboard helicopter lifts a red, partial sea-can container with a triangular white symbol high above the road, across from the Eaton Centre. 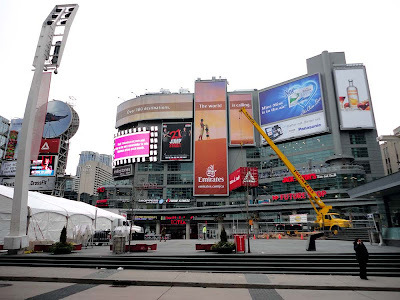 Tomorrow Reebok CrossFit launches the Sport of Fitness at Yonge-Dundas Square with the setup remaining until Feb 25, 2012. The setup in the concrete park includes big, white tent and a crane holding a full sea-can, complete with the white symbol, but this one also says Reebok CrossFit. 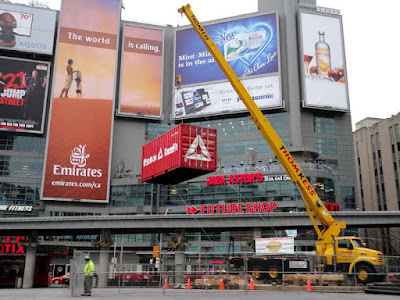 The crane is supposed to drop the sea-can at noon tomorrow (Wednesday Feb 22) for a one-of-a-kind stunt, what will come out of the can - heck if I know? If I was promoting fitness I would have the container full of cupcakes so that people will eat hearty and have to hit the gym. They also talk of WOD and I finally found out what it was "Workout of the Day". "Last month, Reebok took fitness to new heights on the 1,050 foot high outdoor observation deck of Empire State Building in New York City. It is now Toronto's turn to experience The Sport of Fitness at Yonge and Dundas Square with a full range of activities and interactions." posted on the Square's calendar of events.